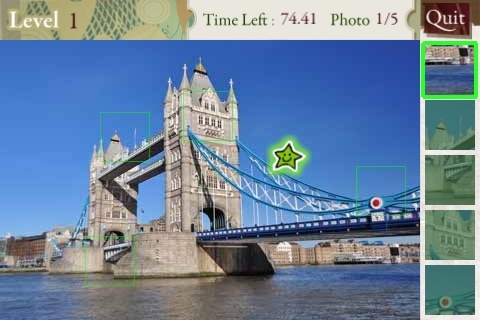 Hit’n Won is a point and click, visual search game. Think ‘Where’s Waldo’ with random images and no missing persons. This game is from IdeasLab Limited and is for iPhone, iPod touch, and iPad. Hoo boy, this is going to be a simple review. At first, this game isn’t bad at all. In the center of the screen you have the main image. There are some objects on the side and you have to tap that same object on the main image. If you are accurate, repeat until you point at all the correct spots. Then you move to another picture and continue. The images are usually stock images with no real entertainment value of say, the ‘Waldo’ series of visual search games. Practice mode is boring and competing online feels stale. Nothing in this game has any lasting impression. It’s just a point and click game with random images that have no connecting between each other. Maybe they could have made some type of ‘journey’ from one location to another? Maybe you could teach me about the wildlife of a specific country, and then show more locations like a city from that country, followed by people of the country? Teach me about a place by making me stare at an image picking out matching areas. At best, this is well executed. It’s kind of like a really good piece of paper. Yeah, the paper was manufactured quite well, but it’s still just a piece of paper. This game gave me a craving to do something else… like Find Waldo. And you know the killer? It costs $2.99 as of 7/29/2010. For this game? Maybe $0.99 at best. AppSafari review of Hit’n Won was written by Joseph Ho on July 30th, 2010 and categorized under App Store, Games, Universal. Page viewed 5103 times, 5 so far today. Need help on using these apps? Please read the Help Page.